The process of soil formation is called Pedogenesis. Soil mechanics is the branch of civil engineering which deals with the study of characteristics , classification and behavior of soil under loaded and unloaded conditions for suitable design of foundation. The scientific study of Soil Mechanics was started by Karl Terzaghi. He is called “Father of Soil Mechanics” . Primarily soils are formed from rocks through physical and chemical weathering. If weathered rock material remains over a parent rock then the soils are known as Residual soils. If weathered material is transported and deposited at some other location then the soils are called Transported Soil. The transporting agency may be water, wind, glaciers or gravity force. Alluvial Soils – The fragmented sediments of rocks transported by water are settled on river bed and surroundings. 28% of Indian area is alluvial soil. It is fertile. the load bearing capacity of alluvial are moderate. 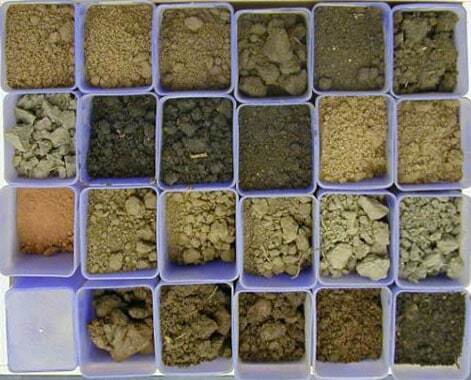 Lacustrine Soils – These are deposited by still water agents such as lakes. Marine Soils – These are sands, silts and clays deposited by salty water or ocean water. Glacial Drift – It is formed by glaciers and icebergs. It contains mixture of boulders, gravels, sand, silt and clay. Colluvial Soils/Talus – These are formed due to gravity forces. In Mountains and hills, on steep slopes soil creeps down under gravity force due to variation of moisture content (hence loosening of soil). Such soils are deposited in the lower part of the mountains i.e valley. Caliche – It is cemented soil, rich in CaCo3. It consists of gravel, sand and Clay. Eoline Soils – These are sand particles, transported and deposited by wind. eg: sand dunes in the desert. Loess – It is also wind blown, uniformly graded fine gravel. Loam – It is a mixture of sand, silt and clay which may contain organic materials too. Cumulose/Muck – These are highly organic soils formed due to the decay of vegetation under water logged condition. Gumbe – These are highly sitcky, plastic and dark colored clay. Marl – These are fine grained calcium carbonated soils of marine origin. These are formed due to the deposition of body cells of dead animals in ocean. Tuff – These are Small grained Slightly Cemented volcanic ash. Bentonite – These are small grained volcanic ashes. The have very high liquid limit and plasticity. These are used for lubrication in drilling.